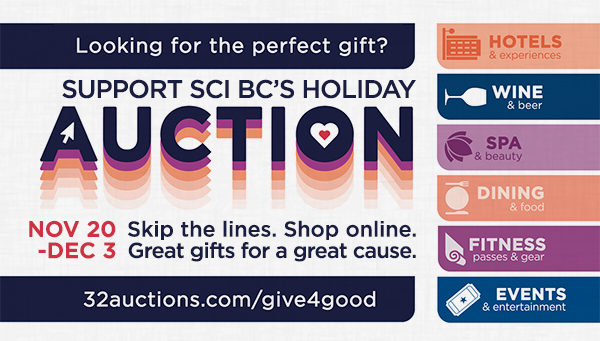 Let’s face it, most of our holiday shopping is done online, so why not support a great cause at the same time with Spinal Cord Injury BC’s (SCI BC) online ‘Gifts for Good’ event on 32 Auctions. The auction runs from November 20th through to December 3rd. With plenty of items to choose from, there’s something for everyone on your list this season. For the adventure seeker on your list there’s skydiving, there are many options for the foodie in your life, and if you are in need of a relaxing local getaway there’s storm watching from a warm hot tub in Ucluelet.